Urinary catheters are useful for a wide variety of reasons and in most circumstances are relatively straight forward to insert. However, there are some circumstances that pose a particular challenge for even the most seasoned catheter handler – enter the dreaded hypertrophic prostate. In men over the age of 60, physiological enlargement of the prostate can begin to cause obstruction of the urethra (the prostate is a glandular structure that sits below the bladder and surrounds the urethra). If a patient with a large prostate requires a catheter, this unpredictable obstruction of the urethra is commonly what causes complications on insertion. When inserting a regular straight tip urinary catheter in these patients, the semi rigid tip travels smoothly along the urethra until it collides with the prostate. Because the prostate sits below the bladder, the catheter needs to change direction and rise over the top of the prostate to reach its final destination – which is something straight tip catheters don’t like doing. In this instance, there is often an impulse to push harder in order to try and force past the prostate – don’t do this. 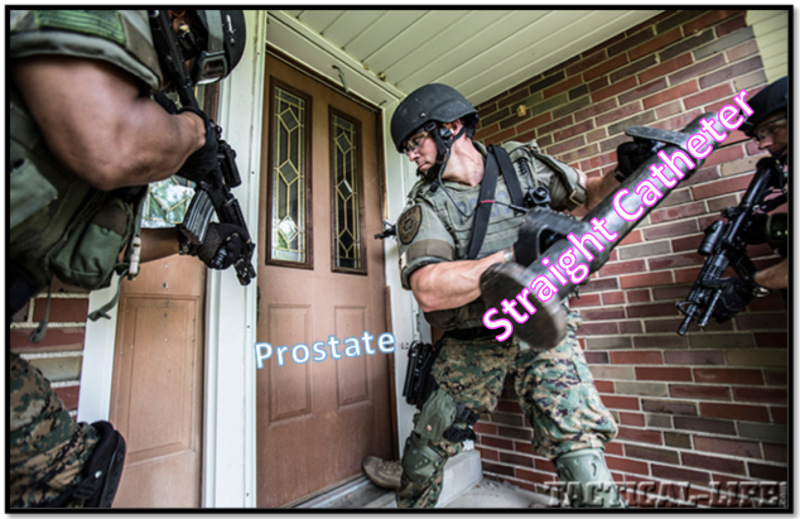 Instead of pushing around the prostate, it is quite likely you are pushing INTO the prostate like a battering ram. In some cases you will get lucky and the catheter tip will find the right orientation and pop into the bladder, but the risk of urethral injury (and the patient crying or smacking you) is higher than it needs to be. For patients at risk of prostatic hypertrophy (i.e. male, age > 40) you are well served to choose a coude tipped catheter as your first catheterisation option. Coude means elbow in French. In real terms what this means is that the tip of the catheter is bent (like your elbow sometimes is). This bend allows the tip of the catheter to constantly angle upwards which greatly aids in the approach to a prostatic obstruction, allowing the catheter tip to glance over the prostate with the correct upward angle to find the entrance of the bladder. All coude tip urinary catheters have an ‘orientation indicator’ dot at the distal end of the catheter (where it connects to the bag). This dot is always on the same side as the upward facing tip of the catheter. When inserting a coude tip catheter, you must ensure the indicator dot is always facing upwards (towards the ceiling / facing the same direction as the patient). Keeping the dot facing upwards ensures the tip of the catheter stays in the right orientation to glide over the prostate as opposed to crashing into it more directly. The white orientation indicator dot circled must face upward during insertion to ensure the coude tip is directed over the prostate. If you are comfortable and competent performing urinary catheterisation in males already, the use of coude tip catheters does not require special training (While I stand by my sweeping generalisation, the actual rules vary from institution to institution: check the particulars where you work). The same principles apply (asepsis, lubrication, consent, fill the balloon, be gentle etc.) the only additional point is to keep the orientation dot facing upwards. While there is a relative paucity of prospective evidence comparing the routine use of coude tip catheters and straight tip catheters, I can find no evidence to suggest there are higher rates of complication or increased risk associated with the routine use of coude tips. In my experience, they seem to be a less traumatic option than a straight tip 16 French in almost every situation. Coude tip catheters aren’t nearly as intimidating as many people believe. My advice would be to find out what options you have in your workplace and work on becoming comfortable using incorporating coude tip catheters into your bag of tricks. Coude may mean elbow in French, but I’m pretty sure it means ‘Thank you” in whatever language the prostate speaks.